Drought is another natural disaster that strikes the country fairly frequently. 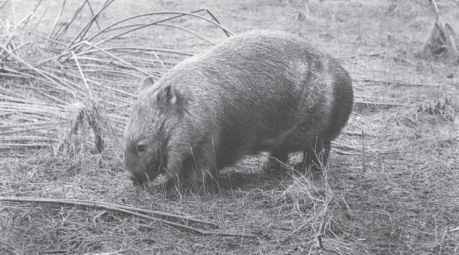 Well adapted to dry conditions as it is - living on the hardier, coarser grasses and drinking rarely - the wombat, nevertheless, can suffer malnutrition and even death from starvation during a prolonged drought, and during the winter following a drought, when a very limited amount of food is available. The breeding rate and successful rearing of the young declines sharply too, and a wombat weakened by malnutrition is more susceptible to other adverse factors such as attack by dogs and dingoes. The hairy-nosed species are particularly affected by drought in the semiarid regions where they live.